What would you do with $1000 in savings? Maybe even 3, 4 or up to $9900? Not sure? Follow my 10 EZ steps to buying a car and save yourself a bundle, then you can spend it on whatever you'd like. Don't have time to learn or just think you know it all? Car salesmen will love you! After making a huge commission I'm sure they'll know how to spend YOUR money. Don't Let The Car Salesman Spend YOUR Money! With over a decades worth of experience and thousands upon thousands of car deals under my belt, I will show you what it takes to buy a car with no headaches and massive savings! My goal here is to share my experience with you so that you can learn how to buy a car while avoiding the pitfalls and learn the right steps to buying a car for maximum time, money and stress savings. Up to $6800 in Savings! Up to $9900 in Savings in just the first 2 sections! No matter what your level of "expertise," I'd recommend reading about the 7 types of car buyer as this will help you to establish a solid understanding of the car buying game - who wins, who loses and why. Never underestimate a car salesman! This new and used car buying guide works for both buying and leasing, but leasing does require you to learn a slightly new language. Take a look at my new car leasing guide to learn to talk the talk. Before you start your search for your new car there are some extremely important steps in this car buying guide you must follow. These steps will set the foundation for either a good experience or a not so good one! If you will be financing your next new or used car, then you'll need to learn how to buy a car on credit. Is your credit rock solid? Are you sure? Have you seen your credit lately, if ever? It's very important to know what's on your credit report and what your credit score is. If the car dealer knows more about your credit than you do...You Lose! 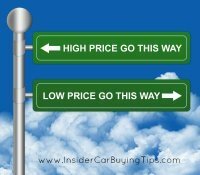 Of course, if you are paying cash for your next vehicle, then this step of the car buying guide can be skipped. However, if you are financing you must know how you will look to a lender and what credit tier you will fall into. The difference between A+ tier finance rates and let's say a B tier can be 5% or more. A 5% difference on a $20,000 loan at 72 months equals over $3,500 in additional finance charges. That's over $48 a month wasted on interest! What if you fell into a C, D or F tier and your rate was 18% more? Now we're talking about a huge difference mega bucks wasted on interest rate alone. Check your credit and score, settle small collections, pay down credit cards and dispute inaccurate information. You'll save a ton of dough in the long run. Go ahead and check your credit score - Fast, Free & Easy with Enrollment at CreditReport.com now. In your next step of the car buying guide you'll want to arrange your own financing and get pre-approved for an auto loan. Of course, you could let the dealer arrange this for you, but you'd probably change your mind after reading about car dealer finance profits and how much they make arranging loans. Outside of the profits the dealer makes from arranging financing, having a blank check in your hand from your own source allows you to buy like a cash buyer. It simplifies the negotiation process and helps you focus on the only number that really matters, the sales price. Not too long ago I had compared 40 cash deals to 40 finance deals and found that on average cash buyers paid over $2,000 less. Add that to the average finance savings of $745 and buying like a cash buyer would save the average customer over $2700! That's significant! See how easy it is to save money by following this car buying guide? If your credit is not the best, then you'll want to take a look at my Bad Credit Car Buying Guide to find tips and loan sources specifically for bad credit car buyers. In the third step of the car buying guide, let's take a look at the three most common types of "insurance" and the pitfalls to watch for. Imagine that you've found your dream car and wanted it so bad that you were willing to pay $75 more a month than you had originally budgeted for. It will strap you a little bit each month, but for this car it is worth the sacrifice. Only problem is that you didn't check auto insurance rates until the day after you signed that very legally binding 5, 6 or even 7 year contract. Not only are your monthly payments higher than you can comfortably afford, but now your insurance is jumping up another $65 a month. Ouch! 80% of the dealerships that I've worked for had very strict no return policies and unfortunately for these customers, they were stuck! Don't get stuck, especially with something as easy as getting insurance quotes. It should always be free to get quotes, it doesn't affect your credit and is typically very fast. Buying an extended warranty can be an excellent idea to pay for any future mechanical issues your car may encounter, but you will definitely want to do your homework ahead of time. There are lots of "fly by night" companies that would be happy to take your money and run! In addition, car dealers can make rather hefty profits selling extended warranties and I'd suggest you get some quotes online to be sure the dealer is not out of line with their pricing. Be sure to read the warranty contract very closely! Extended warranties are often confusing and some deceptive finance managers will sell inferior coverage as top of the line just to put a few more bucks in their pocket. Take a look at these 12 very important questions to ask about your Vehicle Extended Warranty. I'll cover warranty scams more when we get to the 10th step of the car buying guide. If you will be financing your vehicle and not using at least a 25% down payment, then you definitely want to learn the benefits of GAP insurance. In a nut shell, if your vehicle is totaled in an accident or stolen and not recovered, then GAP insurance will settle the difference between your insurance companies payment and what is actually owed to the lender. Without it, you could be stuck paying thousands of dollars to your lender for the difference in what's owed and what it was worth...This happens a lot! Dealers know how popular GAP insurance has become and charge a premium for it. However, the charge for it is negotiable and on average you don't want to pay more than $395 for 72 months of coverage. Many dealers will try to charge $795 or more for this. If you are not familiar with GAP insurance and are planning to finance please do yourself a favor and learn more about GAP Insurance once you are done reading the car buying guide. So far this new and used car buying guide has shown you how to save a minimum of $3150 and the great part is that we are just getting started! Now let's move on to the fun part of the car buying guide and start shopping. Before we do that, I'll show you how to set a comfortable budget and how to save hundreds if not thousands of dollars with ease. We'll also talk about your current cars trade in value and how to figure the car dealers new and used car cost.